Get set for a stay to remember when you check in to the Hotel Soleblu in Rimini. Located in one of the most iconic seaside resorts in Italy, this stunning hotel offers comfortable accommodation and spectacular services, with a variety of packages tailored toward travellers on any budget. Whether you're travelling solo, as a couple, or with the whole family, you'll find fantastic rooms and suites designed to accommodate your entire group. What's more, when you choose to stay at Hotel Soleblu, you can take advantage of delicious breakfasts as part of your booking, or opt in for full-board, catered service with three magnificent meals served up daily. 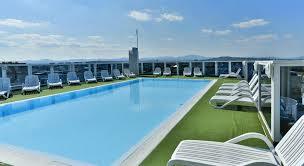 Enjoy a few laps in the pool, then retire to one of many terraces or the rooftop solarium to soak in the sun. Looking to really indulge? Let yourself unwind in the jacuzzi, or simply head to the beach and relax as the waves roll in and out. The perfect place to indulge and unwind, you can choose to de-stress at the hotel, or get out and explore Rimini and the Romagna region beyond. Situated on the eastern coast of Italy, overlooking the beautiful waters of the Adriatic Sea, you're in prime location for savouring some of the best landscapes and climate in Europe. Stroll along the beautiful beaches the region is famous for, or explore hundreds of local bars, restaurants and eateries and savour delicious delicacies bursting with authentic Italian flavours. You're also within easy reach of some of the most famous museums, theatres and galleries in the country, with a thriving arts and culture scene.